Give back your skin a healthy glow at any age! THAT GLOW. My Natural Secrets To Healthy And Glowing Skin. The concern for so many women as we get older is, how do we preserve the health and appearance of our skin? There are a lot of options nowadays, some are natural and some are drastic. Personally I do not believe in drastic measures such as botox, fillers, injections or face lifts. 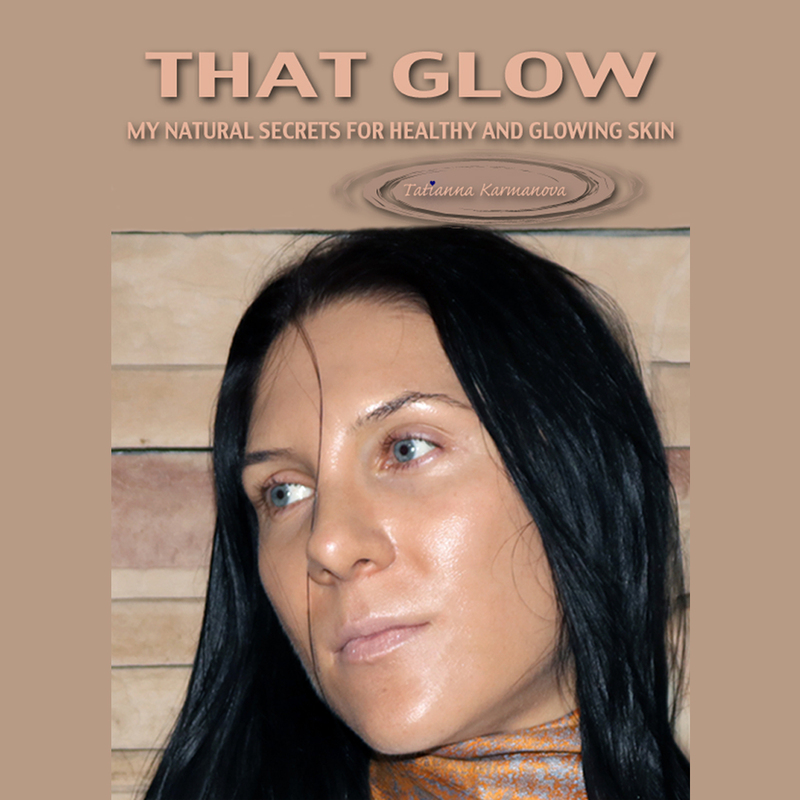 I created this eBook to help all women who desire beautiful skin, so you can glow at any age. After I turned 30, the same skin care routine, the very basic one I used, didn’t work anymore. My skin was starting to look dull, I’ve developed the first signs of aging, some wrinkles on my forehead, smile lines and a lot more pigmentation. I wasn’t open to having face injections/fillers because never liked how they made peoples faces look, even the most subtle ones are noticeable and look strange to my opinion. So I started doing a lot of research, asking advice from other women whose skin I admired and who were natural, looking for natural skin care recipes and minor but natural procedures I can do. I started applying all of my new found information and I was able to get back the glow of my skin I once had and firmness of my face to be even better than when I was in my early 20’s. My skin right now in my mid 30’s looks younger and better than it was when I was in my 20’s. Section One is all about how to create a glow from within. 1. Learn a self love exercise which helped me to transform not only the way I look but also gain self confidence which I never had before. 2. I also share my personal mantra and a very powerful word to use on a daily basis. 1. You will learn all the foods you should eat on a daily basis, I listed all the specific foods. 2. All the vitamins you need to take, I listed all the brands which I personally take and highly recommend. 3. I will also share exactly how much water you need to drink and when. 4. How I wash my face, including the best exfoliation advice which no cosmetic company wants you to know. 5. Complete guide on how to moisturize your face, and I mean COMPLETE GUIDE! 6. My tips on using at home Microcurrent, a Powerful Anti-Aging Tool to keep you face muscles firm and lifted. Section 1: My favorite natural skin care recipes you can prepare at home. Section 2: A complete list of all of my favorite products which I swear by and have been using for years. At the spa salons and dermatologists offices women are being told prevention is key, so they start offering you injection as early as 21, and some women get it even before that. They promise you natural results and in the beginning you might even look natural, but the longer you inject your face the more frozen it will look as time passes. Injections atrophy your muscles, if you don’t use them you lose them. I don’t think it’s wrong if someone choses this route or other drastic measures, it’s just something I prefer to restrain from. I would rather just take care in the most natural way possible. It is not a quick fix, but it’s a guarantee that if you use all the advice I share with you, your face will begin to glow, no matter what age you are. I want you to have beautiful glowing skin!